Letter of Marque Theater Co. is a unique performance ensemble based in Gowanus, Brooklyn creating dynamic and original theater. 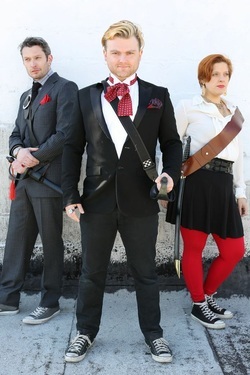 Founded by Welland H. Scripps, Nolan Kennedy and Scarlet Maressa Rivera, (all pictured) the trio has been braving the seas of social change and making waves in the Brooklyn Arts scene, sparked by their 5-week tour across NYC bars and open spaces performing at little or no cost to audiences. As an ensemble of pan-disciplinary actor / playwright / musicians / singers, the L.O.M. trio sets out to challenge the status quo of apathy, tackling questions with innovative and powerful theater designed for this generation. They have an amazing Pirate Casino Carnivale on June 21st that you don't want to miss! ​Join us on this healing journey.